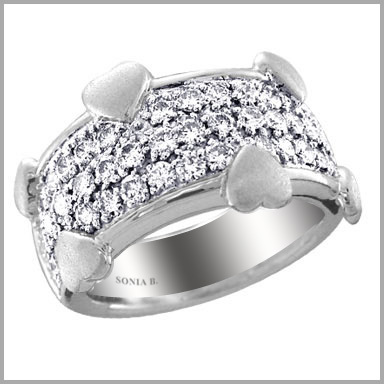 18kt white gold and diamonds ring,1.2650 ct of diamonds. A spectacular ring that will grab their attention! Crafted in your choice of polished 18K gold, this ring features rows of round cut diamonds in pave settings throughout.There are six small hearth adorning this special ring There are 46iamonds for a total diamond weight of approximately 1.2650ct. The setting size is 1/2" x 13/16" x 1/8".